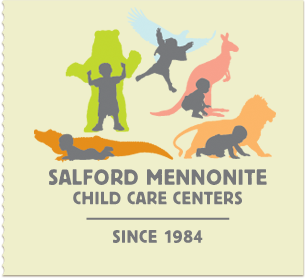 Salford Mennonite Child Care Centers » Blog » Imagine. Play. Learn. Since 1984. SMCCC will be closing Wednesday February 20, 2019 @ 11am. Update: SMCCC will be closed Tuesday February 12. SMCCC will be opening at 8:30 Wednesday January 20, 2019. SMCCC will be closing at 1pm Thursday November 15, 2018. SMCCC will be opening at 10am Thursday March 22, 2018. SMCCC is closed Wednesday March 21, 2018.